It is pretty, check. It is well made, check. It is imposing, check. But how does it handle? Oh this was a fun one to test out. Although you can use is softly a first I started off with a hands on warm using my hand for a soft spanking. Remember the more you slowly warm up a bottom (pun intended) and gradually increase the hits the more receptive they will be when you bring out the big guns. At this point I took out the Angelic paddle and began with a slow brush of the surface on the buttocks. A cold leather surfaces usually gets a small reaction which is fun. I started with soft spanks and my bottom was very receptive. Slowly I hit harder and harder: it did not take long for it to become a hard session. At this point I played it down with softer hits and then build up the intensity. I really loved using this paddle for the session. I find the handle sits really well in the palm of my hand and the toy is not too heavy to tire out my arm. I found it easy to control and man does it give a good hit. The sound it makes can be quite loud too and that plays a lot on the mental aspect of a spanking too. I still adore this paddle and it has become my primary paddle. I barely use my other ones now. It feels so great in my hand and I love the gentle taps that progress to whappings lifting the bottom"s bottom a few inches high. And I get so many compliments on it too. Just stunning visually and quality that will last for years! 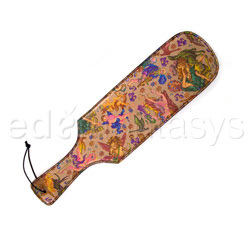 Thank you for viewing Angelic dreams spank her – flogging toy review page!